Saturday was again one of those 'blur of errands' days! SP took care of some car business - oil change and then a car wash. No more snow/salt residue! He also got his hair cut, stopped by South Hills Village, picked up lunch meat & cheese at Portman's, went to Shop 'N Save & Costco, and got gas. Whew!!! He left around 9:30 am and got home around 3:30 pm -- but there were still more errands! He unloaded and put away the groceries and then we went to Robinson Mall. It's Bonus Gift time for Clinique. I also browsed through the shoes and clothes and we looked at ties for the wedding. SP is not wearing a tuxedo. He's wearing his new black suit. But, we needed a tie. We found one we liked and we think it'll look OK with a black suit/white shirt, but we'll be consulting the mother of the bride when she arrives this evening!!! She has final approval!!! We also got him some new jeans and polo shirts. By then, we were hungry, and SP's glucose monitor was beeping the beeps that mean "EAT SOMETHING!" We weren't in the mood for Mall Food Court food, so we decided to try Houlihan's. Spicy & Blue had a decent dining experience there a few weeks ago and we had a coupon. It was probably a bit after 6 when we walked in. We were seated right away - this surprised us both a bit. We expected the usual dinner time in Robinson crowds. I still like the old Houlihan's decor better than this newer, sleeker, modern type decor, but it's not bad. We both ordered iced teas and SP got a Blue Moon beer. 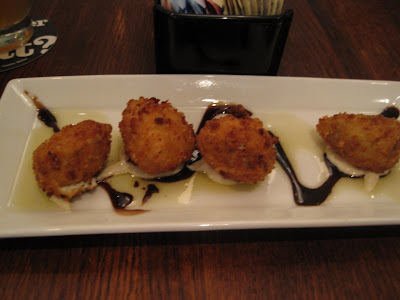 Our coupon was for 2 free Small Plates up to $14. 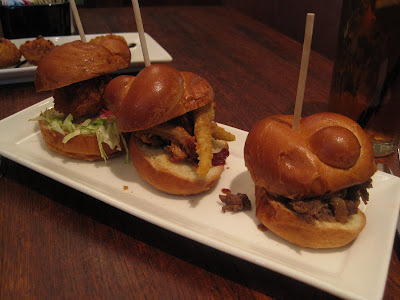 We decided to try a trio of sliders, choosing one each Pulled Pork, Pot Roast, and Shrimp Po'Boy, and we decided to try the Goat Cheese & Artichoke Poppers. I should point out that we assumed the Small Plates were similar to Appetizers. They are listed separately on the menu, but both on the first page of the food menu. I guess I thought they were smaller portion appetizers? Slightly larger portion appetizers? The point is, we would never think to make a meal of Goat Cheese & Artichoke Poppers and/or Frites, so... we figured the Small Plates would be served before our meals. Wrong. Our meals arrived first. We were surprised and asked the server where our Small Plates were. He informed us that the Small Plates are served when they are ready, not necessarily before the meal. Turns out our Small Plates were ready at about the same time so we got them right after our meals arrived, which wasn't something horrible, especially not at a chain restaurant in a mall, but we would have preferred to have our Small Plates first. Back to the Small Plates. 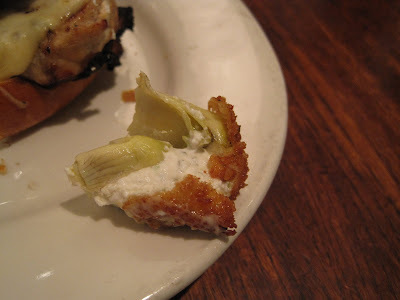 Here's the Goat Cheese & Artichoke Poppers: Yummy. Then again, how can you really mess up something with goat cheese? Or something fried? They weren't too greasy and the balsamic on the plate was a nice addition. I'd get these again. Mmmmm melted goat cheese: The sliders, from left to right Shrimp Po'Boy, Pulled Pork, Pot Roast: These could have been a meal for me! We split each slider, but even so, probably because of the buns, they were fairly filling for me. The Shrimp Po'Boy was the best. The Pulled Pork one was tasty but I would have liked a bit more BBQ sauce wetness. The tiny pickle fries on top of the pulled pork were yummy. The Pot Roast was good, too - even SP tried it and he doesn't eat beef! Again, I would have liked a bit more gravy wetness. For meals, we each chose a sandwich. 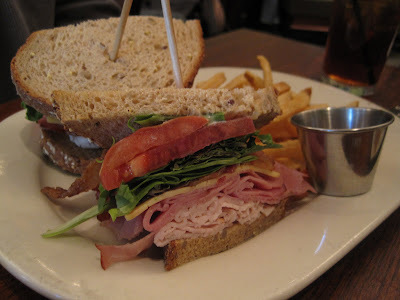 SP chose the Farmhouse Club: brown sugar and honey cured ham, mesquite smoked turkey breast, thick sliced bacon, basil pesto aioli and buttery gouda on whole-grain bread, topped with spring mix and juicy tomatoes. It was huge and came with fries. He said it was very good; it must have been since he ate the whole sandwich! 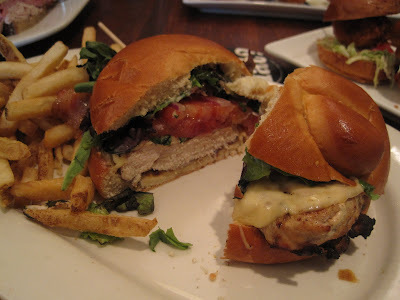 I chose the Brentwood Chicken Sandwich: grilled chicken breast with fresh chopped rosemary, topped with smoked bacon, gouda cheese and Dijon-spiked mayo on a toasted bun, served with baby greens, vine ripe tomato and onion. This, too, was huge and quite tasty. I brought half of it home for lunch on Sunday. 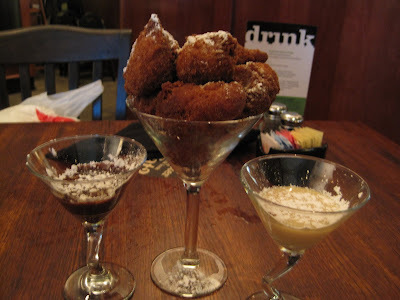 The last time we ate at Houlihan's, we shard a dessert of donuts and they were pretty good. So we knew going in that we were going to order the donuts for dessert. Unfortunately, they weren't as tasty as we remembered. These ones tasted like they had been left in the fryer a bit too long because the outer coating was bit too thick and hard. They also tasted much more cinnamon-sugary to me then last time, and while I love cinnamon, I've never been a fan of cinnamon-sugar dusted donuts. The donuts come with 2 dipping sauces. One was dark chocolate and the other I think was white chocolate, but it didn't seem to really have a taste. I stuck with the dark chocolate sauce. We ate all the donuts, but at the end I was peeling off the outer crust and just eating the insides of the donuts! It was a decent meal and I would go back if we were at the mall and it was lunch or dinner time. 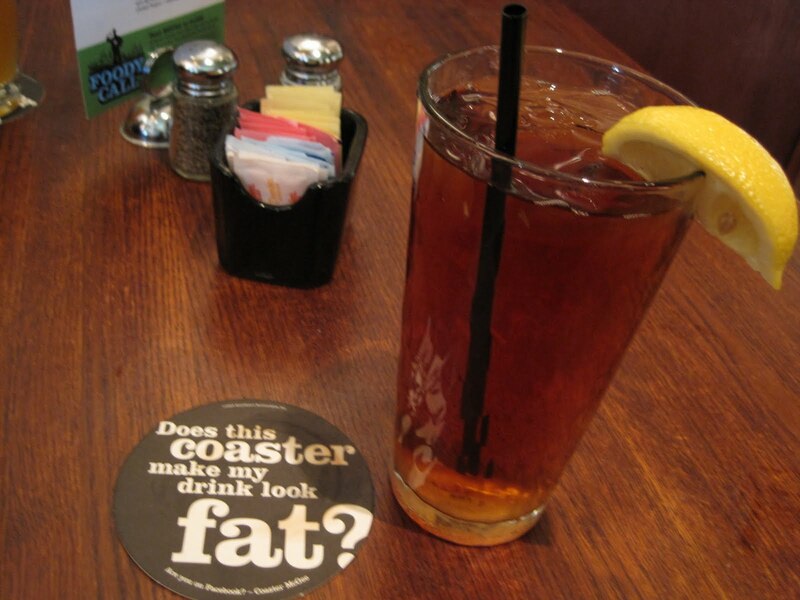 I certainly enjoyed the food more than I do at Bahama Breeze or Olive Garden or other chains. The restaurant did get a bit noisy and it was hard to hear SP and the server. My only other complaint: our server put our check on the table before asking if we wanted dessert. When we said we wanted the donuts, he apologized and mumbled something about how he assumed we weren't having dessert since I didn't finish my whole meal. That does make sense, in the sense of when you're a little kid you don't get dessert if you don't eat all your dinner, but I deliberately only ate half the sandwich so I could have dessert. I almost always eat only about half my meal and take the rest home and then order dessert. Does that make me odd? Do other people do that? I always assumed so. Meals can be huge and if you eat all of a meal, you might not have room for dessert, and for someone like me, dessert is important!! Even if we weren't going to eat dessert in the restaurant, maybe we wanted something to take home for later, which we also frequently do. After stuffing ourselves, we ventured back into the mall. We finally left around 8 pm and we just wanted to go home and relax, so we skipped the other errands on the list. There's always next weekend! Sounds like the food was pretty good (save the overfried donuts), but the server was pretty lacking. He definitely should have told you, IMO, about the small plates not coming out before your dinner. Especially since you both ordered entrees! Who wants all that food put on their table all at once?! It's just going to get cold before you can eat it! He could have controlled that by not putting the order into the computer until after your small plates were ready. I'm surprised by the flow of the meal, too. And servers -always- ask about dessert, especially nowawadays... Bizzare. I do like Houlihan's though. They've got amazing nachos. And, since I'm so young, I don't really really recall the older ones. I *ALWAYS* take home half of my food when we go out - partially because I either want a drink and/or dessert & I just can't handle all that food and partially (mainly) because I'm cheap and I always need to get at least 2-3 meals out of everything.